The canonical model for Type Ia supernovae describes white dwarfs exploding as the result of runaway thermonuclear fusion reactions. This is caused by material accreted from a companion star, which accumulates on a white dwarf’s surface and ignites after reaching a critical temperature and pressure. While there is no question that Type Ia supernovae originate from white dwarfs, the authors of this paper suggest that dark matter may be the mechanism that triggers these explosions. At the moment, the true nature of dark matter remains a mystery. Numerous models have been proposed to explain its properties, and while current evidence seems to favor particle candidates for dark matter, some models have suggested that dark matter may instead be primordial black holes. These black holes (which are extraordinarily small: on the order of – cm) were formed during the early moments of the Big Bang, during which the universe was incredibly dense and local overdensities of matter ended up collapsing into microscopic black holes. These primordial black holes may exist today, and perhaps display observable interactions with their environment (ex. Hawking radiation). Primordial black holes are small enough that they will simply pass through a white dwarf in the event of a collision. However, a black hole’s gravity will accelerate any particle near its trajectory, thereby heating particles inside the white dwarf through frictional interactions. If this region of heated particles is sufficiently hot and large, a runaway thermonuclear reaction within a white dwarf and a resulting supernova explosion could ensue. Nuclear fusion reactions are exponentially sensitive to temperature, so it is not difficult to trigger a runaway fusion event through localized heating of material in a white dwarf. However, the rate of heating has to exceed the rate at which heat is carried away through electron conduction, and this sets a minimum mass that a black hole must have in order to ignite a runaway fusion event. Fig. 1 shows the minimum mass of a black hole that can destroy a carbon white dwarf of a given mass. Fig. 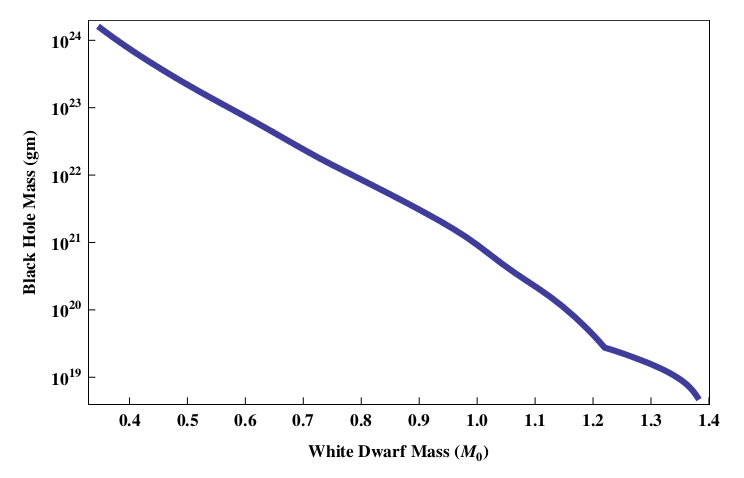 1: The minimum mass of a black hole required to destroy a carbon white dwarf of a given mass. 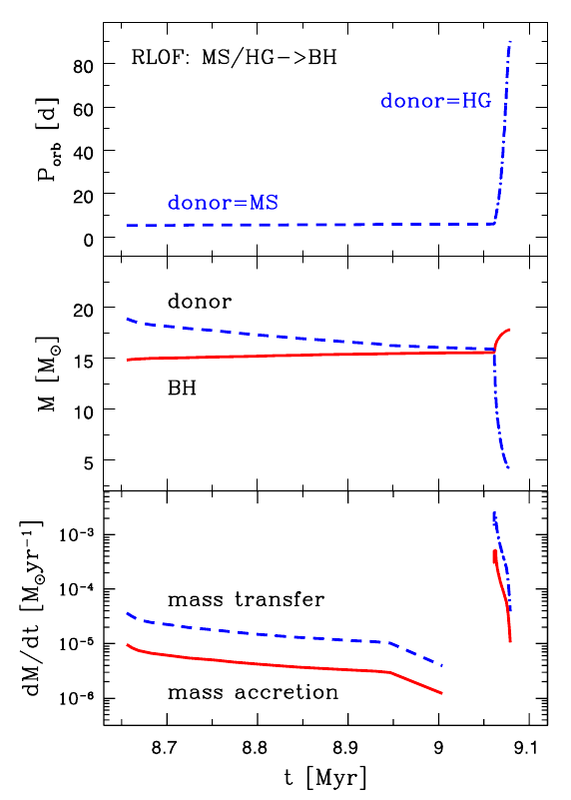 More massive white dwarfs have higher densities, and thus require a smaller perturbation induced by a black hole transit in order to initiate runaway fusion reactions. It is possible to constrain the range of black hole masses by observing white dwarfs of known masses. If there are white dwarfs observable in a region with some dark matter (assuming that the dark matter is actually made of primordial black holes), this rules out a range of potential black hole masses that can exist. This is so because an abundance of sufficiently massive black holes would likely trigger this type of supernovae in those white dwarfs. A similar type of constraint on black hole masses can be done by observing the frequency of Type Ia SNe that occur. 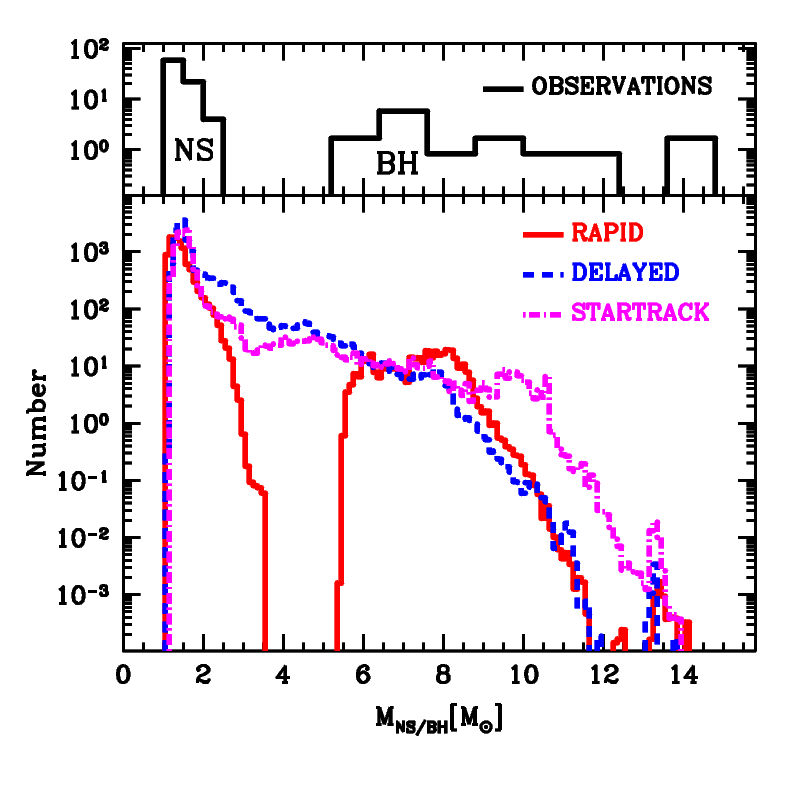 If Type Ia supernovae are at least occasionally triggered by black holes, white dwarf observations could be useful for constraining dark matter candidates (i.e. is dark matter made of compact objects such as black holes, or something else?) Given the current challenges in identifying dark matter candidates and the abundance of observable white dwarfs, these sorts of constraints on primordial black hole abundances should bring us a step closer to solving the dark matter puzzle. Consider also that hot Hawking radiation may stimulate fusion and a runaway exchange.